Lieutenant Chris Hamilton and firefighter PJ Comeau were taken to a local hospital after battling a 3-alarm fire in Salem, Massachusetts. 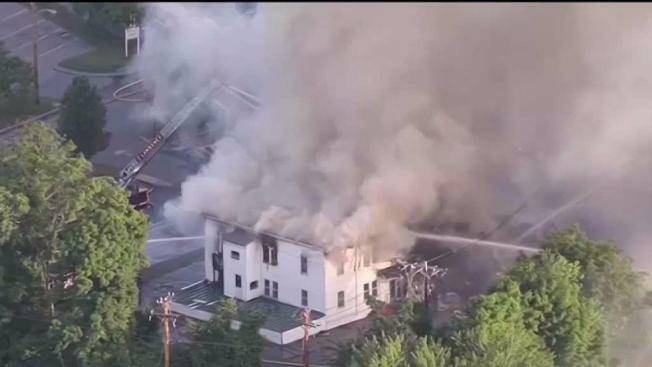 Two firefighters were taken to a Massachusetts hospital Wednesday as crews in New Hampshire battled a multi-alarm fire that destroyed a building containing a restaurant, a vape shop and 10 apartments above it. The fire broke out about 5:30 a.m. in the kitchen at the China Star Restaurant on Salem's Main Street and quickly reached three alarms. Many occupants were forced to bolt out on barefoot. As residents ran out, Lieutenant Chris Hamilton and firefighter PJ Comeau had to fight to escape themselves. The second floor of the building had collapsed down on Lieutenant Chris Hamilton and struck firefighter PJ Comeau, almost trapping them inside. Firefighters were hospitalized after a fire broke up in Salem, New Hampshire, causing a building to collapse. Firefighter Comeau was able to get the beam off Lieutenant Hamilton, who issued a mayday. Firefighter DJ Ferguson, who was sworn in the day before the fire, issued a second mayday. Lieutenant Hamilton and firefighter Comeau, both who exited the building under their own power, were taken to a local hospital for an evaluation. They had been released as of Wednesday night. Fire officials had initially said there were no reported injuries. Authorities said the 17 residents who live inside the 10 apartments were able to make it out safely. “It happened so fast. Like in 10-15 seconds I had to be out of there because there was a big cloud of smoke coming from the kitchen up into the apartment,” Daniel Curita said. "My eyes were burning and I just got out of there as fast as I could." 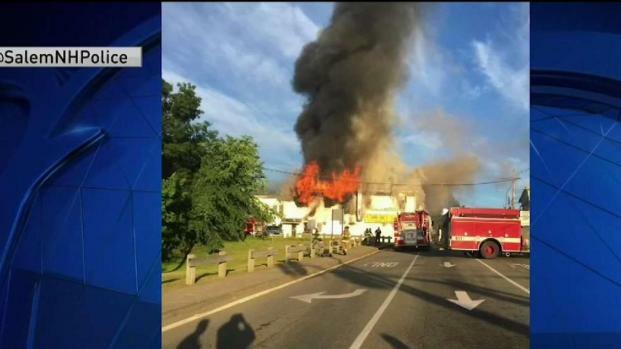 Crews in Salem, New Hampshire had to battle a multi-alarm fire at a restaurant Wednesday morning. Just after 7 a.m., authorities said the building had fully collapsed. The fire forced police to close several streets in the area. By late morning, Main Street between Pleasant and Route 28 was expected to remain closed for most of the day while crews worked on hot spots and demolition of the building. While the cause of the fire is under investigation, the building's 17 residents are looking for places to stay. "It’s a mixture of emotions like thanking God you’re alive and at the same time a lot of stuff was lost in the fire," said resident Philip Momah. Salem Fire Chief Paul Parisi says this is the third apartment fire in town in the last five months. He says the residents heeding the alarms is what saved their lives Wednesday. "It was definitely a close call," he said. The fire marshal says while they do know the fire started in the kitchen of the China Star restaurant, they do not yet know what caused it. Investigators do not believe it was suspicious, however.